So in the last John Work journal, he and Peter Skene Ogden had reached Boat Encampment, having come down the Big Hill from Athabasca Pass. The year is 1823 — three years before the York Factory Express began to make this journey down the hill. But the trail was an old one, used every year by the North West Company men who crossed the mountains into the Columbia District by the dozens. It is not known how many men walked over the trail by 1823, but the number must have been in the high hundreds, if not thousands. Tuesday 14. Thick fog in the morning. Employed the greater part of the day preparing to fall down the Columbia and to send back the horses, part of which are to be loaded with bales of Red corded cloth which is not saleable in the Columbia. This place is surrounded with high hills, many of which are topped with snow, and covered thickly with wood near the base. Wednesday 15. Thick fog in the morning, raw cold Weather. Wind Southerly. Embarked at 9 o’clock, and proceeded down the Columbia River, in three boats or kind of wooden canoes, worked by 8 Men each, who row with paddles and not oars. These boats will carry about 55 pieces and are made of a light construction so that 12 men can carry them across the portages. The boats are very little loaded having only some Indian corn besides what we brought across with us. The Columbia all the way we have come is a fine, large, deep river with high hills on each side, several of which are topped with snow. There are a great many strong rapids & the current all the way is very strong. One of the boats being leaky we encamped early a little above what is called the upper Dalles. The course of the river nearly S. Mr. [Alexander] Kennedy & Mr. [Peter Skene] Ogden are in one boat, Mr. [Alexander] Ross in another, and me in the third. The horse-keeper is to set out on his return with the horses [from Boat Encampment], accompanied by two men who are going out. The general course of the river was rather to the W. of South, with steep hills on both sides, some of which are topped with snow, others covered with wood to the very summit. On the upper parts of the hills the wood appears to be of a small growth. On the low points it is of a larger size. Several small streams fall into the river from the valleys between the hills. The recent marks of beaver was seen at different places. Nuts? I wonder what kind of nuts these would have been? If anyone knows the answer, I would love to know what they are. The meat was not well cured and the salmon were very poor. These people use birch bark canoes which are of a different construction from those in the other side of the mountains. These canoes were almost certainly the sturgeon-nosed canoes that David Thompson described. 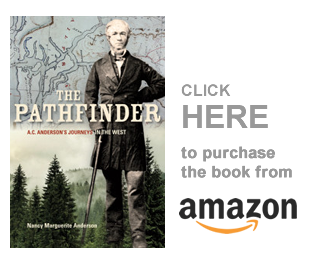 Jack Nisbet writes, in Mapmaker’s Eye, that “The next day, Thompson pushed off from Kettle Falls, into the only section of the Columbia he had not yet charted. This country was frequented by the Lakes (Sinixt) tribe; a group of them accompanied the Nor’Westers as far as the Arrow Lakes in what is now southern British Columbia.” There is, by the way, a new book on the Sinixt people: it is called Not Extinct: Keeping the Sinixt Way, by Marilyn James and Taress Alexis. It is a “Lively introduction to Indigenous Sinixt Culture through discussions of traditional & contemporary Sinixt stories,” according to B.C. Bookworld, Spring 2018, and is published by MAA Press, at maapress.ca. Even though the Sinixt were distant from any fur trade fort, the HBC men were familiar with them, as they traded for bear or mule-deer meat, and obtained snow shoes from these people every year on their way upriver to Boat Encampment. In later years, much of Fort Colvile’s furs came from Sinixt hunters. Embarked at break of day and encamped late a little below the lower end of the Lake which is reckoned about 30 Miles in length. Our course through the Lake was about S by E. This Lake is not very wide, it is surrounded by steep hills generally covered with wood to the tops, some of their summits have no wood but are covered with snow. The shores are generally bold & rocky, except some coves and low points which has wood of a larger growth than what is on the sides of the stoney [sic] hills. On the opposite side of the river where we encamped there was an Indian lodge, from which two Indian Men, a woman, & boy, came & brought 5 salmon which would weigh 20 to 30 lbs. each. We had some of it dressed for supper but it was not good. The salmon come out of the sea in immense numbers & are said never to return. They are remarkably fine when they first enter the river but in a short time get quite lean and finally get so emaciated that they die; they continue still struggling against the stream while they have life. Notwithstanding that the mountains are reckoned 1,000 Miles from the sea, yet many of the salmon get that length before they die. The Natives are now splitting and drying these dead and dieing [sic] fish for their winter’s provisions. A couple of beaver skins & a small piece of fresh meat were traded from the above Indians. 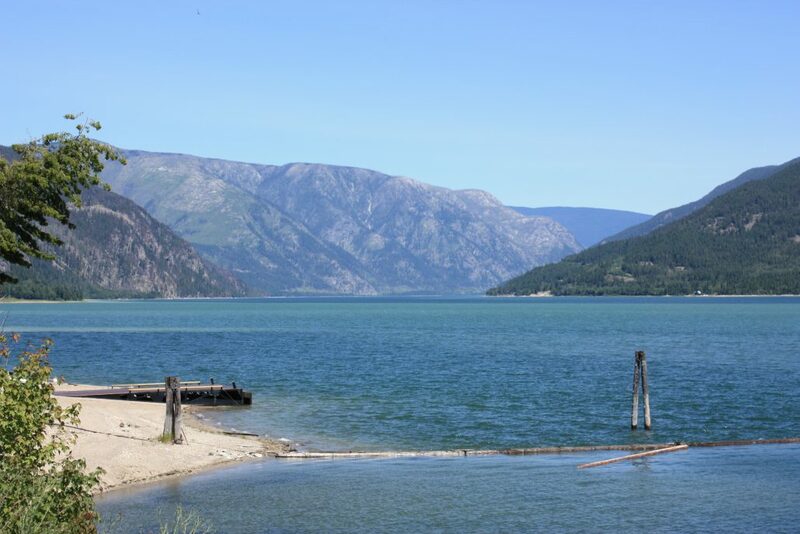 This is a good place to pause: we have reached the south end of Upper Arrow Lake or the part of the Columbia River that runs between the two lakes. It was much narrower than it is now, as the Columbia River is controlled by dams and the water is higher than it used to be. We are lucky that in Canada our river is mostly recognizable: in United States it is not. The next post in this series is likely to be a Governor Simpson post, and will be here, when published: http://nancymargueriteanderson.com/two-canoes-twenty-twenty-five/ I think? Copyright Nancy Marguerite Anderson, 2018. All rights reserved. WorkSafe would NOT have approved! Thank you for your story — you should write it up somewhere, say B.C. History. At least Work and his party had people who knew what they were doing, and who knew the river! He was also descending it in October, when the water was quite low (though low water makes the rapids worse, I think). I am still laughing! The crazy things we do in our youth! Beaked Hazelnut is a possible, as is Chestnut. Also hickory, beech, oaks, pine, and rose. A.C Anderson’s son, James, wrote “Trees and Shrubs, Food, Medicinal and Poisonous Plants of British Columbia” but the book offers little help on this. If you look at http://treenuts.ca, there are plenty of nut trees around — its just figuring out which are native to B.C., and which grow at the Arrow Lakes. As I recall (but can’t recall a source right now), Priest’s rapid was so called from an Indian, perhaps a shaman, who sat on the bank pontificating like a preacher. High water tended to flood over the rocky obstacles, making it easier to float down, rather than portage. Yes, and that is the Priests Rapids on the lower River. You are exactly right. But as far as I know, in the days of the York Factory Express, there were no Priests Rapids in the upper river near Revelstoke — yet they seem to exist. These rapids might have been named after 1849, or else they remain unmentioned in the various journals I collected. But I remember there was a time on the upper river, when a bunch of priests jumped out of the boats when they were terrified by the river and drowned themselves and their wives….. That might be the origin of the name. I mentally connect it with John Tod coming downriver, will find his biography and see. Here it is, in John Tod’s biography, “John Tod, Rebel in the Ranks,” written by Robert C. Belyk. They were coming downriver with incoming express in 1838, when John Tod went ahead in the first boat, leaving two boats behind. The third boat came downriver, the people and passengers frightened by the Dalles des morts. They survived that, but at the Little Dalles a botanist took up his young wife in his arms and jumped overboard, planning to swim to the river banks. As a result of his jumping off the boat, it overturned, and twelve people drowned. Three children’s bodies were recovered and buried at a post on the Arrow Lakes. Archibald McDonald of Fort Colvile called it one of the most appalling calamities on the Columbia River. John McLoughlin Jr. was there, but he survived. Hmmm, Tom. I’m not sure above story has anything to do with Priests Rapids on the upper Columbia, though. There is a Priests Rapids, on The Columbia River north of Downie Creek, Kootenay District. Well, looking at the map, Downie Creek flows into the Columbia at Revelstoke, so that’s about right. It is definitely in the Little Dalles Canyon, if not Steamboat Rapids itself. Thank you for investigating Priest Rapids and reporting the horrifying tale of the 12 who perished at the Dalles des Morts (Death Rapids). If I had known of this back when we were surveying the Columbia, I probably would never have gotten in that boat! BTW, we didn’t find any evidence of Indigenous peoples along the Upper Columbia but we did find plenty of evidence of mining activity (from the time of the Big Bend Gold Rush in the mid-1860’s and still on-going at the time of our survey), including the site of old “City of Ophir” inland from the river. I conducted the research and survey of these historic sites and found that the Ministry of Mines annual reports were very useful in understanding the settlement and mining activity going on along the Upper Columbia and it’s tributaries in the 1860’s. I wonder if there was any mention of Priest Rapids in those reports?